Can the Corp use Restore to install an agenda from Archives and remove any other copies of that agenda from the game? Can the Corp use Restore to install an asset, upgrade, or ice from Archives that they don't have enough credits to rez? Yes, as long as they are able to pay any install costs. If the Corp cannot rez the card installed with Restore (either because they cannot afford to do so or because it is an agenda), do they have to reveal it? Yes. 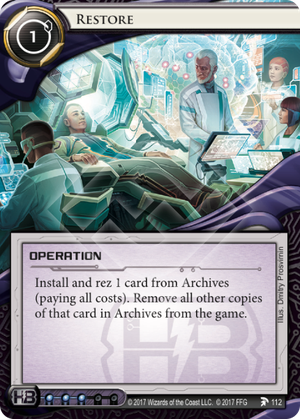 The Corp must reveal the installed card to confirm that it cannot be rezzed and to confirm any other cards in Archives that must be removed from the game. Now that Friends in High Places has been officially removed from play (MWL 2.0), this card makes a lot more sense. To consider the value of corp recursion, it helps to compare it to its core counterpart, Archived Memories, which I think set a pretty good precedent for getting stuff out of archives. Archived Memories - For a click and a card with two influence, you get to add a trashed card directly back to HQ. Preemptive Action - As your last action of the turn, you may spend a click to recur three cards from archives, but must tutor or draw them again naturally to get them back into HQ. Overall, similar prices with slightly different uses. Outside of HB, Preemptive Action is probably an easier choice. FiHP - As your last action of the turn, you may spend a click, two credits, and a card with one influence to recur two cards from archives and install them. To achieve the same thing with Archived Memories you'd have to have two copies (potentially costing 4 times the influence), play both, then spend two more clicks installing them. The cost for saving three clicks, three influence, and a card slot? Two credits. Restore - For a click, a credit (plus the installed card's rez cost), and a card with three influence, you may recur a single card, install it, and you must rez it. To achieve the same thing with Archived Memories, you'd have to spend a click and a card, and then another click to install the new card (rezzing it whenever you need to). In general, that's not a good deal, but if you really need assets, upgrades, or ice back fast, this will do the job. It's exactly what FiHP should have been all along. This card really makes you scratch your head when you remind yourself that Friends in High Places was released just one cycle earlier. On the plus side it is one credit cheaper and is not terminal, however the restrictions it imposes are nothing to scoff at. You can install one fewer card and have to remove any other copy from the game which can be a significant drawback. Also note that the rezzing part is mandatory, so recovering a big ice such as Tollbooth makes you pay in advance. The rezzing part would have been more useful in a meta where either Leela or Blackmail were prevalent. As it stands the rez is more of a downside. You can also compare this card to Archived Memories. Instead of getting back any card, you pay one more credit to immediately install it, but you have to rez it, so you cannot use it for traps. All in all this seems to be most fitting for low rez-cost cards such as high impact assets like Jackson or gear check ice that was parasite'd. Do you have room for such a card? I'm really not sold on it. This card could have been interesting, but I believe it was designed poorly in fear of becoming another Friends in High Places. This card has a lot of potential uses; Rezzing a big peice of ice in aginfusion, Blackmail/ddos protection, Getting back a must have asset that has to be protected, but it seems likely they stacked too many downsides in fear of the card getting out of hand. Removing all copies of the chosen card just seems messy, firstly it's difficult and inconsistent to play around and makes itself worse the later the game goes on, but it also introduces a nebulous gamestate since it doesn't reveal archives: maybe a copy is a facedown and wasn't removed and since the archive order isn't maintained another copy could be put in there later. On top of that they seemed extra scared of the effect becoming another Friends / Jackson Howard must include in every deck so they gave it three influence practically ensuring it could only be used in HB, who already have Archived Memories and friends. This could have been an interesting card if it removed itself and cost 1 or 2 influence as a worse version of the (perhaps to-be MWL'ed) friends but as it stands I think its an expensive card for niche effect. There is also some discussion of if you can remove agendas that hopefully will get ufaq'd. I agree that Restore is not a strong card. However it has the potential to be rather obnoxious in the right deck. Combined with Friends in High Places it can make relatively cheap trash-to-fire assets like Estelle Moon (2) come back from the dead even more often (and now I have "can't fight the Moonites" stuck in my head again). Yes, there is the risk that you need to throw a card out of the game, but for that you could use FiHP if you can afford to wait a bit or accept the price if your strategy is better served by pressing onward.